At the LA Auto Show Yokohama pulled the sheet off a new tire dubbed the “Avid ENVigor”. This new set of rubber soles are designed to combine three principals that Yokohama have been pushing lately: performance, comfort, and eco-sensibility. That’s a lot for one tire isn’t it? Well, if I’m deciphering the press release correctly it seems like all three of those things come into play in the tread design. You get grip in various conditions but with a reduced road noise sound and the increase in traction is supposed to translate into better gas mileage. I’m thinking that’s where the eco-sensibility comes in. Good on you Yokohama! FULLERTON, CA. – (Dec. 3, 2009) – Yokohama Tire Corporation is raising the bar on performance with the introduction of its all-new AVID® ENVigorTM. The tire is the first to offer consumers the ideal blend of all-season performance, low rolling resistance, smooth comfort and long treadlife. 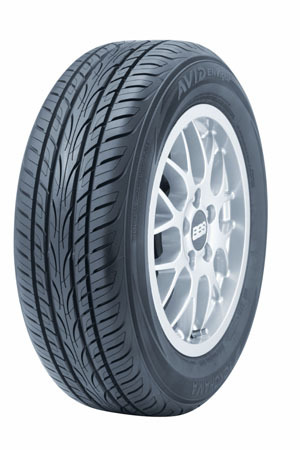 It goes on sale in March 2010 in 69 sizes, making it one of the largest tire launches in the company’s history. The ENVigor features Yokohama’s proprietary Adaptive 3D sipes that help maintain water and winter traction; angled groove walls and circumferential grooves that resist hydroplaning; a tapered center rib and unibloc shoulder for stiffness; a six-pitch tread variation for reduced pattern noise; groove-in-groove technology for reduced uneven wear; and an all-new silica compound for excellent fuel efficiency. Designed for a broad range of vehicles – including entry-level and luxury coupes, sedans and SUVs – the ENVigor will replace Yokohama’s popular AVID H4s/V4s and W4 tires.